Positano's (4948 Fairmont Ave, Bethesda, MD). Brandon R. Shank, PharmD, MPH, BCOP, CPH. as it will facilitate checking in for this program with the company. Hello everyone, Thank you all for attending today's WMSHP program. Make sure that you have turned in your CE sheet today, complete with NABP, signature, and codes of attended programs. and check in a few days to complete your survey questions to get your credits. You have until the end of October to finish these questions. Please email webwmshp@gmail.com ASAP if you have any questions. The place for guests to park would be the Traville gateway garage floors 2-6 highlighted in red (the rate above would apply here). There is limited free parking on the streets. In the highlighted yellow region is where free parking is (be wary of no parking signs blocking some of the areas). Parking cars adjacent to the Traville gateway garage near the glass fields have been known to being towed. 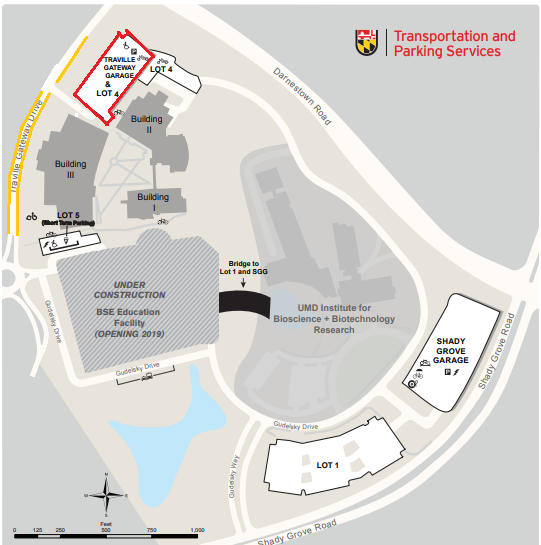 Also, parking in lot 4, cars can be ticketed along with the lot 5 (it is only 30-minute parking). -The rooms are right next to each other. The Traville Gateway Garage is right next to Building II. -The number of buildings are on the doors for easier navigation. 1. Please visit www.kcentraprograms.com and complete the online registration form. 3. Send an email to kprogramsupport@mei-nyc.com. Please be sure to include your full name and contact information so that we can call you back to complete your registration. 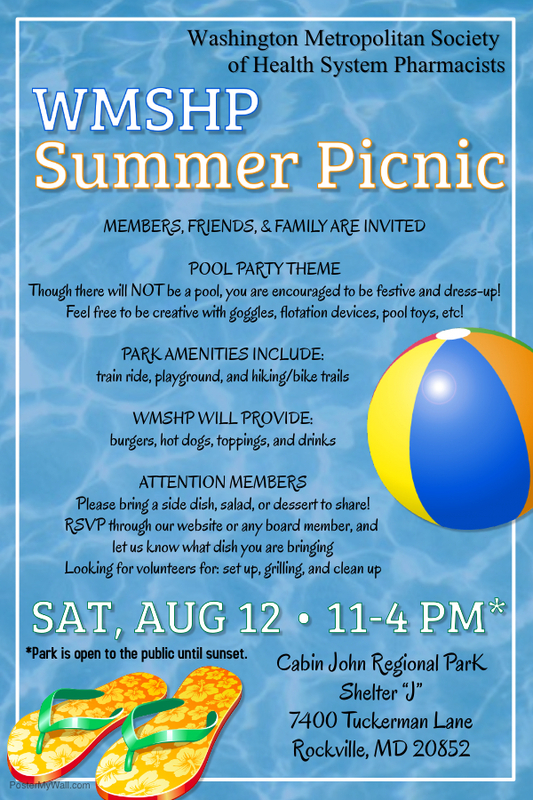 Location: Cabin John Regional Park - Shelter "J"
Please RSVP before August 7th via Google Spreadsheet or by emailing one of the Picnic Coordinators. before Wednesday, June 20, 2018 to confirm your reservation. Student Non-member: $20 (includes WMSHP membership). Technician Non-Member: $35 (includes WMSHP membership). Please RSVP by 3/19 to webwmshp@gmail.com with your Name and License Information. 1. Please visit http://kcentraprograms.com/458/ and complete the online registration form. that we may call you back to complete your registration. Come Join US as we bring pharmacy students and professionals around the Metropolitan area together for a networking and educational opportunity where you can earn up to 2 CE credits! Lunch will be provided! THERE IS NO COST TO ATTEND. RSVP REQUIRED BY NOVEMBER 14, 2016. Clinical Professor, George Washington University. November 10, 2016; 6 pm. A Case-based Presentation" (Sponsored by CSL Behring). Cornell Medical Center, New York. Date and Time: 6:30 pm October 6, 2016. Email: webwmshp@gmail.com AND pay on-site (cash, credit card or check). Card or Pay Pal by Registration due dates). There are no restrictions from the Company for federal pharmacist members of WMSHP to attend this presentation. PLEASE NOTE: RSVP Lana Konigsberg, PharmD at : Lana.Konigsberg@sanofi.com by no later than June 27, 2016. PsychU is coming to you! This speaker is a paid consultant to Otsuka Pharmaceutical Development & Commercialization, Inc. and will be compensated for participation in this event. Presentations and material provided through PsychU are intended for your educational benefit only and do not represent medical advice. PsychU has numerous Virtual Forums and Live Events scheduled for the upcoming months – all available for free to the PsychU Community. Sunday, May 15, 2016; 7:00 am - 4:45 pm. How do I sign-up for the program for the May 15th Meeting? (cash, credit card or check). and pay by Credit Card or Pay Pal by Registration due dates). NIH CC Mazur Auditorium, Building 10, Bethesda, MD. or visit www.nih.gov and select “Visitor Information”. and President-elect in the program agenda. and for current members to renew their membership. membership recruiters on April 16th. Pharmacist (2-year Renewal): $160 reduced to $140. 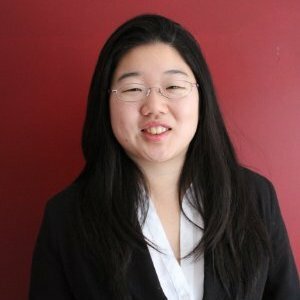 1st Year Pharmacist: $60 reduced to $45. PLEASE NOTE: IF NEW MEMBERS JOIN AT THESE DISCOUNTED RATES OFFERED TODAY, THEY CAN BE USED TO REGISTER AS MEMBERS AT THE SPECIAL RATE FOR THE WMSHP MAY 15, 2016, PHARMACY EDUCATIONAL MEETING WHICH WILL PROVIDE UP TO 6 HOURS OF ACPE CREDITS. Date: Wednesday, April 13, 2016. Chevy Chase, MD 20815 (Tel: 301-986-5255). knowledge of the disease state and provide a forum for in-depth discussion. and company policy, Sanofi-Aventis is unable to pay for any guests meals. the meeting. We sincerely appreciate your understanding and compliance. Speaker: Deidra Couch, PhD; Medical Science Liaison - Neuroscience, Otsuka America Pharmaceutical, Inc.
Thursday, March 31, 2016; 6:30 - 8:30 pm. Attendance is limited to 60 people and open to WMSHP Members (at no cost). Note: There is no restriction from the company for federal pharmacists to attend. Seminar is being kindly supported by the Medical Science Liaison, Neuroscience Division, Otsuka Pharmaceuticals, Inc. The new officers will be officially installed with the 2016 WMSHP President Vaiyapuri Subramaniam, PharmD, on January 12, 2016, at the WMSHP Kickoff Educational ACPE-approved Program. Details forthcoming. WMSHP thanks all members who voted in the recent election. The ASHP-WMSHP delegate will be announced in January 2016. Use Discount Code "WMSHP" and Attend for Only $29! Members, Families and Friends Are Invited. MEMBERS PLEASE BRING A SIDE DISH, SALAD, OR A DESSERT TO SHARE! is not to say federal government employees are not welcome. The company just can’t pay for their meals. They will have to identify themselves on the sign in sheet (by their work address) and receive their own bill from the restaurant waiter/waitress. the company website in the attached flyer. The closing date for registration for WMSHP members as soon as possible by no later than April 22, 2015. Click link below to register and claim CEs within 30 days from the seminar date. PRESENTER: PAUL W. ABRAMOWITZ, PHARMD, SC.D. First come first serve to 40 members maximum. So please RSVP early! If you have RSVP and cannot attend, please contact Sarah before 8/25/14. Sponsor by: Gilead Sciences, Inc.
MEMBERS PLEASE BRING A SIDE DISH OR A DESSERT TO SHARE***PRIZES FOR THE BEST SIDE DISH AND DESSERT!! 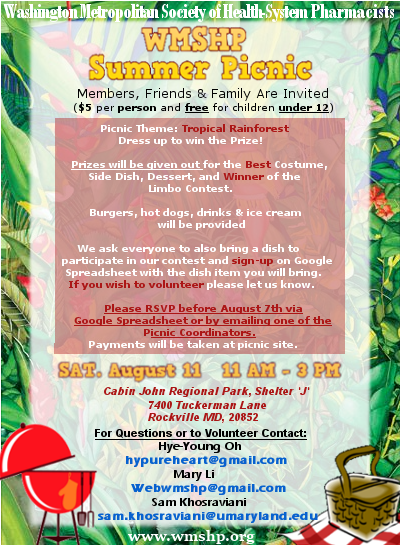 Volunteers for set up, grilling, and cleanup are welcomed. Please contact Wafaa, Sharon or Vicki. Reserve your ticket today! Topic: Atrial Fibrillation: Prevalence, Consequences and Costs. Sponsor by: Daiichi Sankyo Inc.
April 2014 Non-CE Event/Networking Event. Topic: Impact of Medication Therapy Management (MTM) on Hypertension Control and Adherence. If you have RSVP and cannot attend, please contact Sarah before 3/20/14. Sponsor by: Daiichi Sankyo, Inc.
Topic: "Hyponatremia for the Pharmacist"
Sponsor by: Otsuka America pharmaceuticals, Inc.
Topic: Recognition and Treatment of Hyponatremia in the Hospital Setting. Registration info will be sent to WMSHP members by Monique. Sponsored by: Otsuka America Pharmaceutical, Inc. Hosted by DeWayne Reed. performances by professional ballroom dance teachers! Special prices for WMSHP members and family: $20 for 5 group classes! $50 for 12 group classes! Wednesday, October 23, 2013 WMSHP Networking Dinner for students, members and residents! Program: "New Advancement for warfarin reversal"
If you register and cannot make it please email Monique before June 7. Are they? And what do they mean for pharmacists? Time: Garage Parking for Flat rate of $4.00. Featuring 6 CE credits total and raffle prizes at the Hilton Rockville Hotel! See program agenda below and RSVP before Sept. 20, 2013. Kaiser Permanente Health Plan of the Mid-Atlantic States, Inc. Title: Poor Health Literacy + Medication Non-Adherence=A Potentially Deadly Combination! If you have RSVP and cannot attend please contact Monique by June 20. Bring your whole family! First 20,000 fans get a FREE t-shirt, so COME EARLY! SOLD OUT; Registration is Closed. 6:45 - 7:45 PM Poor Health Literacy + Medication Non-Adherence = a Potentially Deadly combination! contact Monique by June 20, 2013. Topic:"Take these two tablets and call me in the morning." Topic:"Anemia Management & Parenteral Iron"
Topic:"Residency Showcase: New beggining. Beyond the basics. Associate Professor of Medicine, Michael Edwards Pharm D, Mark S. Epstein Pharm D.